What with it being Mozart s 250th birthday today and all, it s time for a musically-oriented story. 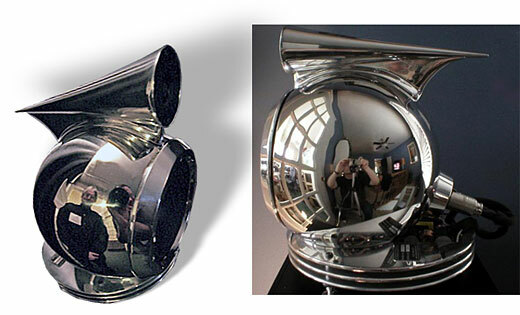 Perfect for listening to "Eine Kleine Nachtmusik" (A Little Night Music), here's a pair of ultra high-end loudspeakers that look like a cross between a chrome-plated bullet microphone, a diving bell and a Teutonic helmet from Hell. The Type One from Studio Electric has a dynamic range of 80Hz to 18KHz, with the tweeter up top in that cone-shaped assembly, and a 6.5-inch woofer in the bulbous bottom section. If that 80Hz number isn't low enough for you, add a subwoofer to take those lows down to a level that s somewhere near purgatory. All this chromium style doesn't come cheap, though. Perfect for listening to The Ride of the Valkyries—get yer Wagner on, bro, and Mozart, too (happy birthday, Wolfie!) for $7950 for a pair.